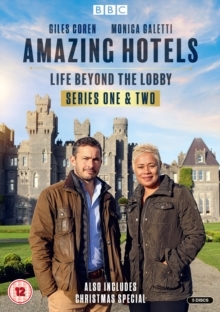 All 12 episodes from the first two series of the BBC travel documentary following Giles Coren and Monica Galetti as they visit some of the world's finest hotels and learn how they operate behind the scenes. Series 1 episodes are: 'Marina Bay Sands, Singapore', 'Mashpi Lodge, Ecuador', 'Giraffe Manor, Kenya', 'Royal Mansour, Morocco', 'Fogo Island Inn, Canada' and 'Icehotel, Sweden'. Series 2 episodes are: 'The Brando, French Polynesia', 'Anantara Al Jabal Al Akhdar, Oman', 'Grand Resort Bad Ragaz, Switzerland', 'Ashford Castle, Ireland', 'The Silo, South Africa' and 'Hacienda Vira Vira, Chile'. The collection also includes the Christmas special 'Kulm Hotel, Switzerland'.